I am a professional magician here in Houston and I specialize in entertaining corporate audiences. I have a very fun, amazing, interactive, and CLEAN show which is always a hit with corporate crowds. I have entertained at thousands and thousands of events and found that people of all ages and walks of life absolutely love watching amazing magic, and by adding comedy I am able to make it a really wonderful experience for your group. I also try to involve people from your group as well as integrate information specific to your audience into my performance to make it fun and personalized. I accept credit cards and checks and my show has a 100% guarantee. EVERY show is a GREAT show! Please check out my website for show information, photos, references, and video at www.curtmiller.com. 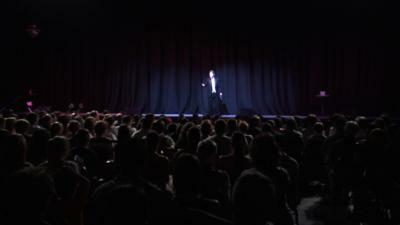 Houston Magician Curt Miller has been entertaining audiences for over 25 years. Combining amazing magic, hilarious, clean comedy routines, and audience interaction, Curt will provide a performance perfect for your next event! 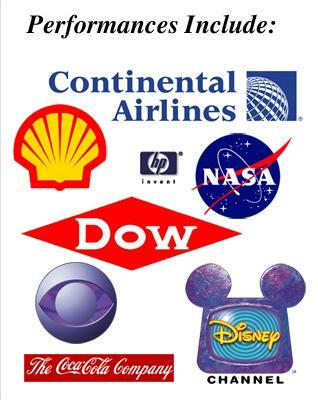 Curt performs for corporate events all over the country, with such clients as Texaco, American Express, and NASA. A resident magician at Houston's prestigious MAGIC ISLAND for five years, Houston Corporate Magician Curt Miller has appeared on national television on "The Disney Channel." Curt Miller has a magic show perfect for any size event, from private parties, to corporate events and trade shows. Houston Magician Curt Miller is the perfect choice to entertain your guests, clients and employees. I provide everything for most events. If you want a larger show for your group, I may need risers, which the hotel can provide. This will make sure your group can see the show! "Personally, my favorite part of your show was the planning phase. You came up with a way to tie in the "Dream Box" as it related to our campaign with very little input from me. Once we settled on that, I was so busy that I had to trust you to carry off the rest. And just as you promised, our employees had a great time! Thanks again!" "You are truly a professional and we appreciate the effort you put into making our evening very delightful and entertaining. You are very talented and I wouldn't hesitate to recommend you to my business associates as I am sure they would enjoy your performance as much as we did." "I wanted to take a few minutes to tell you that everyone at the party thoroughly enjoyed your performance. In the past, our department Holiday party seemed to be an event people dreaded because it was usually very dull. Believe me when I say that our party this year was anything but dull...thanks to you! Everyone who attended the party talked about it for days afterward, 're-hashing' every trick and trying to figure out how you did it. Thank you for making our party such a huge success." "You were a hit! I have been involved in planning five Christmas parties with my company and, by far, your entertainment was the most enjoyed. I have received nothing but positive comments about your show. You truly provide entertainment, not just a magic show. Your professionalism and talent shone through and made this Christmas party the best ever!" "I have received no fewer than one hundred positive comments about our holiday party. We attribute much of the success of the event to your performances throughout the evening. When planning the party we were looking for something a little different than just the standard dinner & band. We were hoping to find something magical that would make the evening special. Your performances during the party definitely provided us with that 'magical touch' we'd hoped for. I would like to talk to you soon about performing for us again at next years' event..."
"Your 'Make-Your-Boss-Disappear' illusion was a huge hit! The whole company has been buzzing and wondering where he went!" "You were a hit at our appreciation event. We had employees from around the world, and every one of them enjoyed your show! Everyone kept asking me where did I find you!!! You truly made it an unforgettable evening. I would definitely recommend you for any event needing a magician." "I wanted to thank you for an excellent performance. Everyone I have spoken with has complimented us on the entertainment. You are truly a professional. Your wit and personality make your show a memorable one, and I highly recommend the show to anyone who enjoys excellent humor and magic." "You were the 'hit' of our Global Gala. We are extremely pleased with your performance, and we would definitely recommend you to anyone needing a magician." "Let me tell you how pleased we were with your performance at our annual Customer Holiday Reception. We still can't figure out how you do it! The comments from customers and employees have all been so positive, I do not know why we didn't have you sooner. The whole show was tremendous, and I can't thank you enough for your professionalism." "I just wanted to express our thanks for your wonderful performance at our Senior Manager Christmas party. You topped off the evening with a very funny and entertaining show. I have received glowing endorsements of your performance from all of our guests. We look forward to having you back for one of our future parties." "I commend you on a most spectacular and enjoyable performance at our recent 'The Magic of American Express' client appreciation evening. We have never had so many compliments from our clients after previous events as we have with this years'! Statements from our clients ranged from 'Where did you find him? He's great!' to 'I purposely sat at a front table, and I still cannot figure out how he did that.' You truly put the 'Magic' into this event!"